Business Times reported yesterday that SAPURACREST Kencana Petroleum Bhd, the merged entity between Malaysia's two largest oil and gas (O&G) players by assets, is on track to make its debut on the Main Market of Bursa Malaysia by middle of next month. 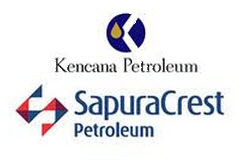 SapuraCrest Kencana is the amalgamation of SapuraCrest Petroleum Bhd and Kencana Petroleum Bhd which had received shareholders' nod to marry in their respective extraordinary general meetings last December. SapuraCrest executive vice-chairman and president Datuk Seri Shahril Shamsuddin said SapuraCrest Kencana is on track for listing and currently, the firm is going through the administrative process to resolve shareholders issues such as capital reduction, prospectus launch and complying with the court order. "For now, it is business as usual and we will continue to make a profit before we can announce any dividend policies, contract value or new bids," Shahril told reporters at a press conference on the Sapura & Kencana Red Ribbon GP Ball 2012, to be held on March 22 in conjunction with the Sepang Formula One race, here yesterday. SapuraCrest and Kencana are the title sponsor and Richard Mille is the co-sponsor of the event. Kencana chief executive officer Datuk Mokhzani Mahathir said the new entity will reward shareholders the way SapuraCrest and Kencana have been doing before, although no dividend policy has been planned yet. SapuraCrest and Kencana are merging to become among the world's top five players to rank alongside global O&G giants such as Italy's Saipem, France's Technip and the US McDermott's International Inc. The RM11.85 billion merger deal will create Malaysia's largest integrated O&G service provider by assets. Under their cash and share swap deal, special purpose vehicle Integral Key Sdn Bhd will buy all the assets and liabilities of SapuraCrest for RM5.87 billion and Kencana for RM5.98 billion. Prior to the merger, SapuraCrest and Kencana will be delisted followed by the listing of the merged company SapuraCrest Kencana. Shahril and Mokhzani will become group president/chief executive officer and executive vice-chairman of SapuraCrest Kencana respectively. Datuk Hamzah Bakar, the current SapuraCrest chairman, will be nominated group chairman. The enlarged entity will be able to serve its more than 20 clients of mostly oil majors in a better manner as it will now have more than 500 vendors under its wings. Shahril declined to reveal the value of its current bids, but in past news reports he had said that the merged entity is eyeing more international projects, especially in Australia and Brazil, to boost its already fat order book of RM13 billion.